Every year at PAX East, there’s a fun, innovative 2D retro-inspired platforming action game that bends the limits of the genre. Last year it was The Messenger (swooooon! ), and this year it might most definitely be Askiisoft & Devolver Digital’s Katana Zero. 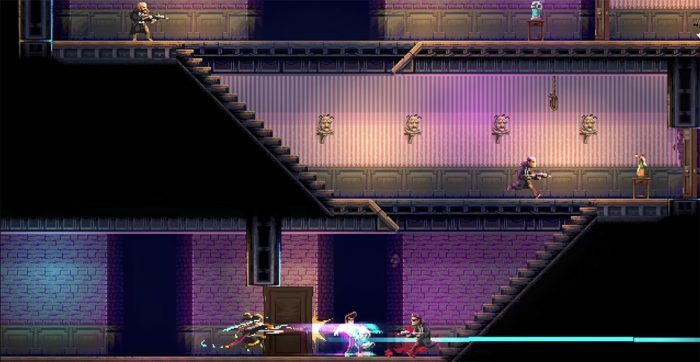 The game plops us in the shoes of a ninja assassin in modern times, complete with a katana in hand, and has us running and slashing through arena-like rooms. There are time-based story elements that allow us to make decisions and tune conversations and situations with NPCs to our preferred (or usually surprising) outcomes, depending on how fast we want to make it through the plot. And, based on those decisions, the game can change and adapt its narrative and action sequences (and its plentiful endings). In one area of the demo at PAX, we pass through a police station to get our next missions. The desk attendant seems to have a thing for us, and continues to ask us questions about why we’re in a ninja outfit. If we rush through (essentially by answering “shut up” or “I have to go” before the timer exits its red-colored bar) then we start to raise the tension. She asks again. I try to rush it again. TENSION PEAKING. I have a feeling that if I do it again something bad will happen, so on her third time asking I wait until the bar passes into its regular answer area, popping up three possible replies. “It’s cosplay.” Ahh, okay, she buys it. She asks a couple more questions and then sets us on our way. Though our answers feel like they’re meaningless, they matter later on when we come back to the station, now filled with gun-wielding officers questioning why we’re covered in blood. “He’s just a cosplayer,” she replies, and we get to pass through unharmed. While all of that functions quite well, the main hook of the game is actually its time slowdown and reboot mechanism. Styled as if someone is watching a VHS tape of a battle sequence, we run through rooms as best as possible. If we die, the tape “rewinds” and our mystery narrator tells us that the scene actually didn’t play out that way. “No, that’s not it.” This is meant to inform us that we’re not so much playing a game, but reliving memories of the best possible way that we made it through a room. It’s quite novel, and a great way to inject time-based effects into the game. In fact, we can slow down time as well, with the tap of a button, to dash through laser beams or ventilation fans, or to even sneak up on enemies and swipe back their bullets. It’s delicious. It’s also pretty violent, as heads explode and bodies get thrown around, in beautiful 16-bit glory. Yum! The smooth controls and timeshifting gameplay blend together perfectly, and add up to a game that is firmly on our radar. 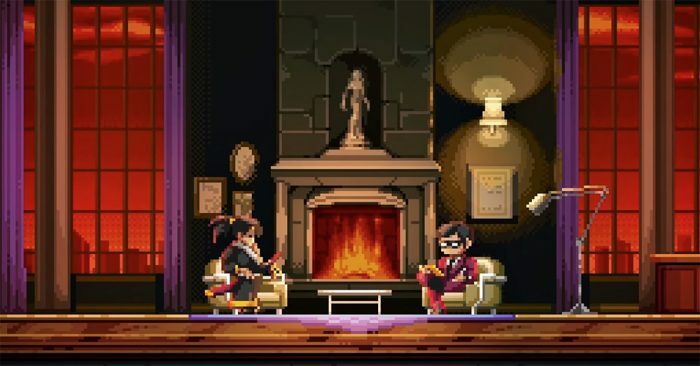 Katana Zero launches on Nintendo Switch and PC on April 18.